WILMINGTON, Del. - Feb. 11, 2015 - PRLog -- This is NorthDelaWHEREHappening's first award nomination as a Delaware small business. "As a 3+ year old small business in North Delaware, we couldn’t be more proud and humbled by this recognition." according to Tracy Zigman, Co-Publisher. "Our fans are what makes our site happening – we are so very grateful for their loyalty, connections and viewership. This opportunity to serve our LOCAL community has been one in a million!" *BEST WEBSITE, awarded to the DSBC member company that has the best visual, interactive, or user-friendly website. NDH is enouraging viewers and fans to vote, if they feel NorthDelaWHEREHappening.com has delivered in these categories. Please GO VOTE for all Delaware Small Biz FAVs! Established December 7, 2011, NorthDelaWHEREHappening.com http://northdelawhere.happeningmag.com (NDH) is a FREE source for everything happening in New Castle County, North Delaware. Viewers enjoy hyper-LOCAL coverage of community, restaurants, events, people, places, and everything else fun & exciting in the area. Follow NDH on Facebook, Twitter, Instagram & Pinterest; join in the conversation, and be the first to know What’s Happening and WHERE in North Delaware! Check the weekly weekend guide for all the top picks for What’s Happening every weekend. Produced by LOCALS, for LOCALS, about the LOCAL area. NDH is also host to 2nd Annual The Happening List (http://northdelawhere.happeningmag.com/happeninglist/), the only people’s choice contest centric to New Castle County, Delaware. With 2015's List hosting 170 categories spread over 11 groups like beauty & wellness, food & drink, people, places, pets, services, weddings and more. 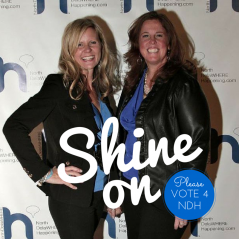 In 2014, NDH launched the 1st Movers & Shakers DE (http://northdelawhere.happeningmag.com/north-delawares-to...), celebrating the achievements of LOCAL North Delawareans who are making an impact in our communities. NDH offers a plethora of robust LOCAL content for all ages – check out the weekly Weekend Guides or simply visit www.NorthDelaWHEREHappening.com to experience What's Happening and WHERE. The Delaware Small Business Chamber(DSBC) incorporates the best of local & state business organizations and partnering together to help Delaware and the region’s small businesses by bringing networking to another level. 2016 "Happening List" Celebrates Winners in North Delaware! 2016 “Happening List” Launches in North Delaware! 2015 “The Happening List” Launches in North Delaware!